Of all of the hair products on my shelf, there’s two that I couldn’t let anyone steal from me. One I’m pleased to say is a budget buy; the other… not at all. But I wouldn’t call them saviours if I didn’t think they were worth every penny. First up, let’s talk hairspray. Once I’ve finished styling my hair, the finishing touches always require a good hairspray. There’s nothing more important than keeping everything in place, so a good amount of hold is super important. However I never aim for hold that’s so strong there’s no movement; Fudge’s Urban Iced Raspberry & Vanilla Hairspray does the job perfectly. It’s a ‘strong hold’ which claims it can do so for 24 hours. Although I disagree with that as I’ve never needed 24 hour hold, its other claim is completely true. The ‘anti-frizz properties’ keep my hair tamed and polished. I’m leaving the best part until last, and that’s the scent. This hairspray is the first I’ve found that doesn’t send me queasy; I absolutely hate the usual scent of hairsprays! We all know the ones that smell so toxic they give you head fumes. So I instantly fell in love when I saw this was Raspberry & Vanilla; there’s nothing toxic, just a beautiful scent that makes me happy to flick my hair and smell the benefit! It also gets brownie points for its ability to be brushed out without that ‘crispy’ feeling. A contrast to that £4.99 bargain is the L’anza Healing Colorcare Trauma Treatment. At £19.80 (eek), you might think this is a rather unworthy price for a hair treatment. However, I have never, (and I mean never) used anything this good. This stuff helped my fragile hair repair itself to be able to grow again (as you may know I suffer from mild alopecia), as well as thickening the hair that was already in tact. A hairdresser introduced this product to me a couple of years ago when I was making the big change from a heavily dyed ombred barnet to a sunkissed blonde, and I have never been more grateful. Not only has this repaired my hair, it’s also amazing for increasing the drying time, and I hate waiting for it to dry! The way I apply this is from the advice I was given; I’ll wash my hair before bed but leave out the conditioner, then apply as much as I possibly can to the entire lengths of my damp hair. I’ll then brush it through so it’s thoroughly covered, and stick the hair dryer on it for a couple of minutes. Once it’s dried a little, I’ll either stick it up in a bun or wrap my Soap & Glory Hair Turban around my head, then sleep on it. The next morning I’ll wash it out and be left with the softest, silkiest hair ever. The bonus with this treatment is that it contains SPF, so it’s perfect for taking with you on a hot holiday with all of the potential damage from the beach. I’ve done this before, and used it like a regular conditioner which works a charm. 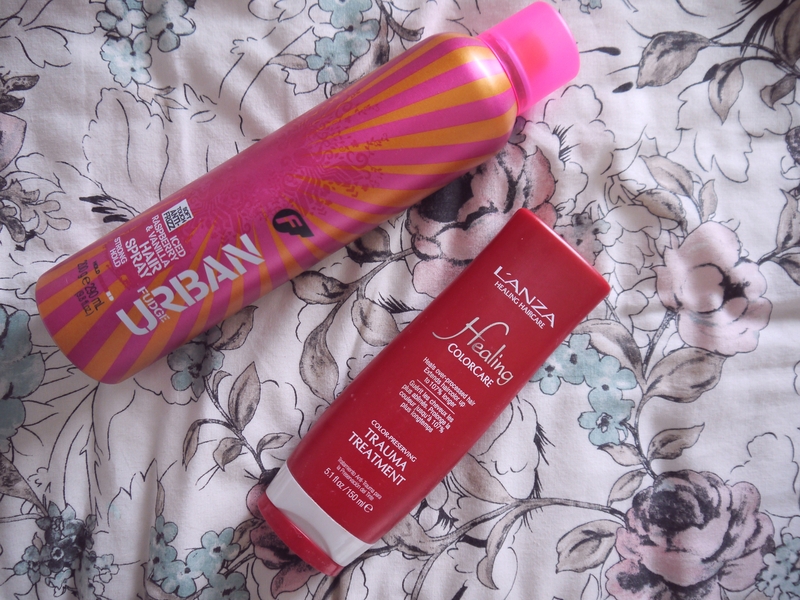 So these are my haircare saviours! Have you tried either of these products?